As I said here in my Thiruvathirai kali recipe, I got a help from my colleague Venkat for the recipes of kali and kootu. He went beyond my expectation and sent the recorded audio recipe just straight from his Aunt. The way of explanation was very authentic and so the recipe. Since we don't make kootu on thiruvathirai day, I was not aware of its preparation. Upon hearing the audio recording he sent, it was all the kootu we prepare on pongal day. It has various names like Thiruvathirai Kootu, Kali Kulambu, Thiruvathirai Sambar, Thiruvathirai Kulambu, 7 Kari Kootu, Pongal Kootu and Thalagam. Tamarind - 1 lemon size ball. 1) Soak tamarind in a cup of water for 15 minutes and extract the juice from it. Keep aside. Pressure cook the toor dal and mochai. I kept in two bowls in a single pressure cooker. 2) Meanwhile, clean and chop vegetables as cubes. I used loosely packed 1/2 cup of all the vegetables I mentioned in the ingredients list. Keep them immersed in water. Keep ash gourd and pumpkin separately. 3) In a pan, heat a teaspoon of oil. Roast coriander seeds and channa dal. 4) When both are roasted and releases nice aroma, add dry red chillies and grated fresh coconut. Roast till the coconut turn golden brown. 5) With the help of little water, grind it to a paste and keep aside. 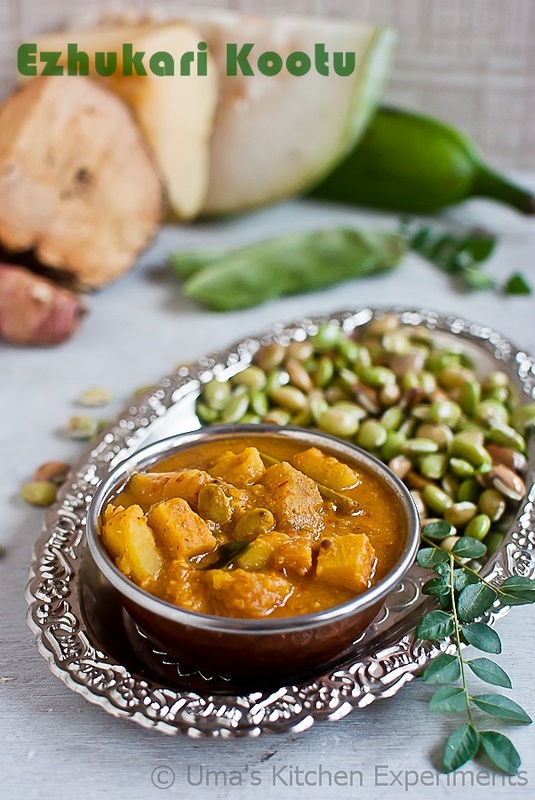 6) In a wide pan, take all the vegetables except ash gourd, pumpkin and mochai. Sprinkle turmeric powder, salt and 1/2 cup of water. Cover, cook till the vegetables are half cooked. 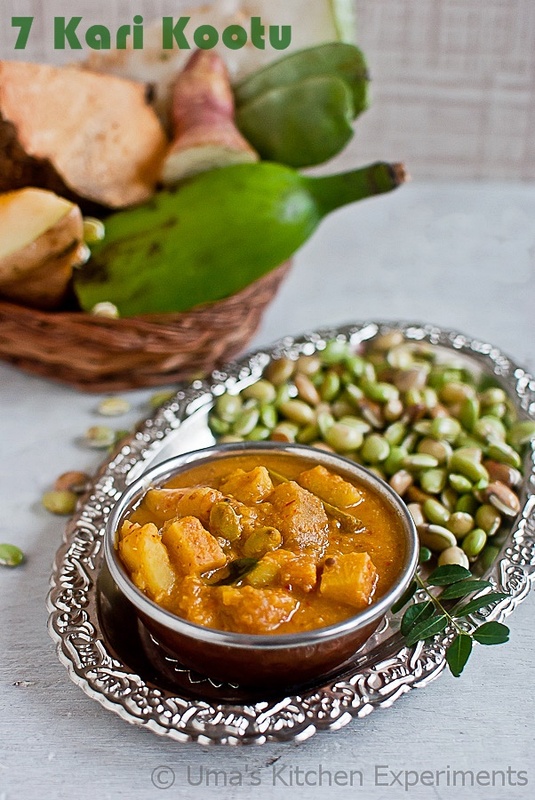 7) Add Ash gourd and pumpkin. Gently mix and cover again to cook it. Since both Ash gourd and pumpkin tend to cook faster, I added in between when other vegetables are half cooked. 8) After few minutes, add mochai and tamarind extract. let it cook uncovered till the raw smell of tamarind goes. 9) Add ground paste. Use some water to rince the mixie and add it to the pan. 10) Add the ground toor dal. Mix gently. Add jaggery if using, Give a boil and simmer till you get the desired consistency. Generally the consistency would be neither thick nor thin. 11) At last, In a seasoning pan, heat the oil given for seasoning. 12) Throw mustard seeds, fenugreek and curryleaves and allow it to splutter. 13) Turn off and add the asafoetida. Pour this mixture immediately to the kootu we prepared. 14) Cover till you serve to keep the flavour of seasoning. 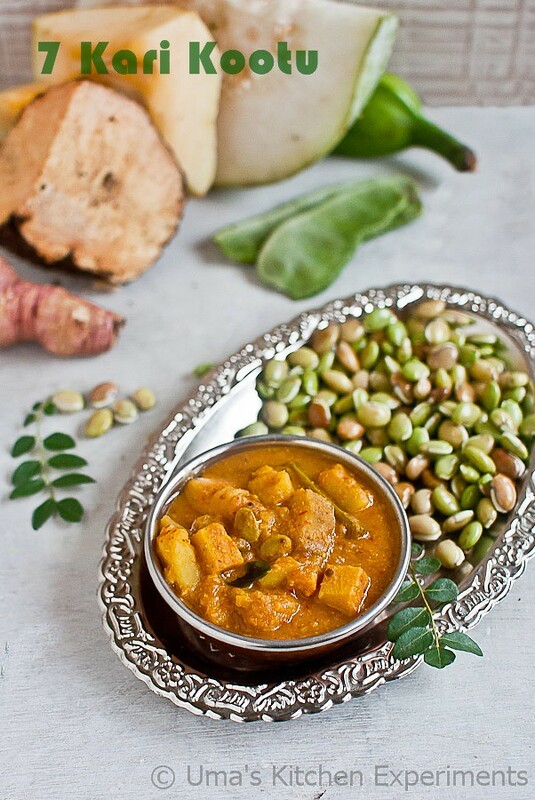 1) Any country vegetables can be used for this kootu. Try to use any root vegetable, for the authentic taste. 2) You can even pressure cook the vegetables and continue cooking the rest of the step as described above. 3) Don't reduce the coconut quantity and the measurement I have given is correct for the vegetables I used. 4) Adding Jaggery is optional. Since I added sweet potato, I skipped adding jaggery. 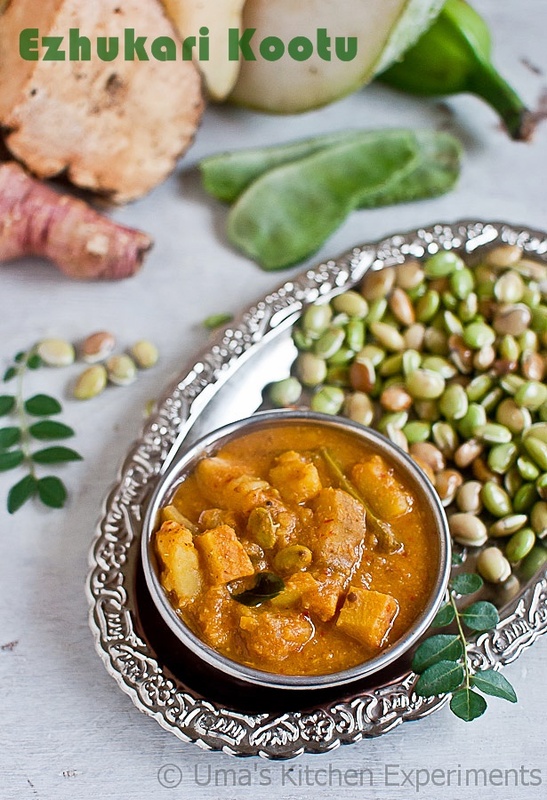 5) Though it is traditionally served with Kali, it can also eaten rice plain rice or roti.